Some people is good at exploiting the sympathism of human nature. At a busy skywalk in Bangkok, a puppy dog sat obediently and quietly in one corner; its mouth biting on a handle skillfully attached to a paper cup. Look! It was as though the puppy was begging for money. It is so tiny and cute, the paper cup is larger than its face. 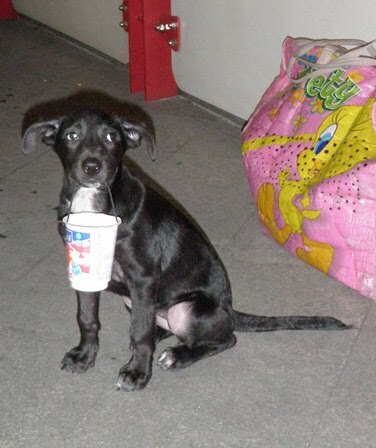 The cup got heavy with coins donated by passersby, and the puppy dropped the handle. Maybe its teeth were not strong enough or its mouth is tired of holding it up. The owner of the puppy was nowhere in sight. But later he appeared, made the puppy bite on the handle again and supervised it from a distance. People fell for it, including me!